Almuninum Boat Etch Wash cleans, brightens, and etches aluminum surfaces in a single step so finishes adhere strongly, without peeling or cracking. This Chromate-free cleaner works in just five minutes to remove corrosion and oxidation on bare aluminum, galvanized steel, and other non-ferrous metals. Most paints have a hard time sticking to aluminum to begin with. It’s no secret that many pontoon boat manufacturers coat an aluminum finish with wax to protect it. Paint on top of that, and peeling is a promise. Likewise for older aluminum boats if all traces of corrosion and oxidation are not removed completely before painting. Proper surface preparation is critical to painting success on aluminum and other non-ferrous metals. Etching the surfaces provides the tooth necessary for primers and finishes to adhere. Aluminum Boat Etch Wash cleaner and conditioner etches the surface then rinses away completely, leaving a surface that’s chemically clean and ready-to-paint, with temporary protection against corrosion and oxidation. Once primed and painted, it helps ensure paint stays put and doesn’t peel. Which helps protect aluminum from oxidation and corrosion and keeps it looking good longer. It’s easy to apply a thin coating of Aluminum Boat Etch Wash using a brush or spray equipment. Keep the surface wet with Etch Wash, and don’t allow it to dry on the surface. For any areas with oxidation buildup, use a Scotch-Brite pad to abrade lightly. After 5 minutes, use fresh water or deionized water to rinse the surface. Rinsing removes Etch Wash completely, as well as any oils and contaminants. After rinsing, you’ll notice that the water runs completely off of the metal surface, with no beading, indicating that the surface is free of contaminants. Dry the surface completely, then apply paint immediately before oxidation sets in, which can happen pretty quickly. Even leaving the boat overnight and painting the next day can cause adhesion problems. 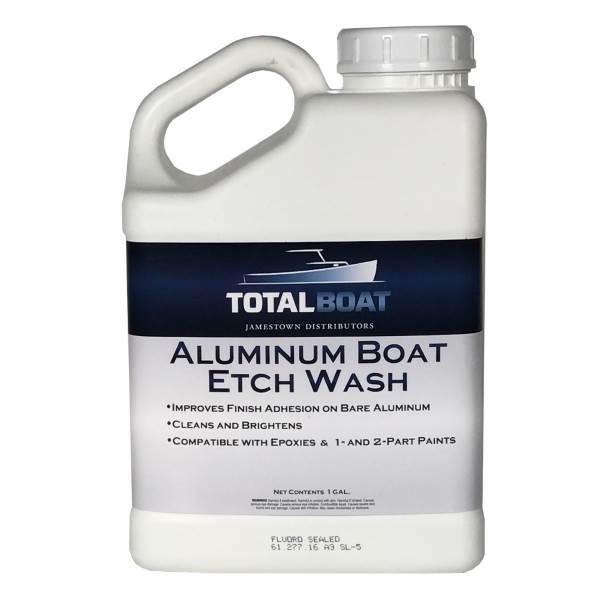 Aluminum Boat Etch Wash is compatible with one- and two-part finishes, and can be used above or below the waterline. For example, to protect your aluminum fishing boat, treat the surface with Aluminum Boat Etch Wash, then apply TotalBoat Aluminum Boat Barrier Coat, and finish by overcoating with TotalBoat AlumiPaint AF antifouling bottom paint specifically formulated for pontoon boats and aluminum fishing boats. Like the look of your bright, shiny toons and wouldn’t dream of covering them with paint? Aluminum Boat Etch Wash marine cleaner and conditioner cleans and brightens dirty, dull aluminum surfaces, and gets them ready for polish. Note: Do not allow Etch Wash to dry on surface. Reapply as needed to prevent drying. After 5 minutes, rinse with fresh or deionized water. Safety: This product contains phosphoric acid. Before using, please read and follow the handling and first aid recommendations in the SDS (Safety Data Sheet) and the instructions for use in the Technical Data sheet. Avoid contact: Do not get in eyes, on skin, or on clothing. For personal protection, ensure that the work area has adequate ventilation, and always use a proper apron, rubber gloves, and goggles when using Aluminum Boat Etch Wash. CAUTION: Do not use to clean wood or fiberglass. In addition, do not use it on aluminum castings, high copper-bearing aluminum alloys, or painted metal surfaces.